Older folks and technology don’t exactly blend together like a cocktail on a warm summer’s eve. In fact, explaining technology to our older generation can be a lot like pulling teeth. At some point they gave up keeping up on the latest technology and when you tell them about the internet they don’t understand. It’s okay though. At some point we will be just like them I’m sure. 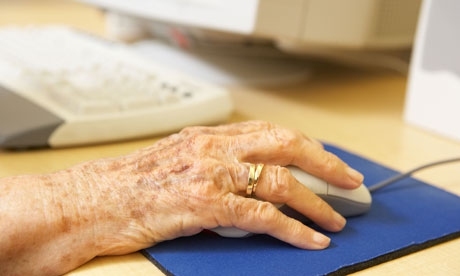 For now, though, there are plenty of reasons for older people to hate the internet. There are too many buttons for them. They can recognize the keyboard but only the part that used to appear on a typewriter or word processor. When it comes to all the things on the screen you have to click on, well, you lost them. They don’t seem to understand how the computer knows. They think differently. We just click and open things. They want to know why the computer knew. Yes, there are people out there who still use dial-up. For those of you who are young enough not to know what that is, well, just consider yourselves lucky. Nothing was more painful than trying to load a page that had a few pictures on it. You would have enough time to open the page, go make a sandwich, eat the sandwich and come back just in time to see the page completely load. Why would they send an email when they can just write a letter themselves and send it to their friend or family member? Better yet, why email when you can call? Picking up the phone is easier than unplugging the phone line and putting it back in the computer so you can spend several minutes dialing into the internet. Their parents told them the TV and radio did it so they think the computer will rot our brains. That seems logical. Who can read such small letters so far away? Well, your grandparents can’t. This annoys everyone. Now imagine you have lived on this planet for 80 years. Do you really want to spend 45 seconds of your life this way? Hell no. Older folks know you just spent 45 minutes watching people get knocked down, fall off their bikes, jump off roofs and everything in between. Is it any wonder they think our generations are dumb? They would much rather watch the ‘Columbo’ rerun anyway. Older folks don’t know how to navigate the internet. They don’t know a reputable retailer from an identity thief. This just causes problems that you inevitably have to help solve. This email is telling me if I give my bank info to them they will deposit millions in my account. Seems legit! Sometimes the older generations have a hard time understanding passwords and remembering which password goes to what. Who am I kidding, we all have that problem. Oh, and ABC123 is not a good password. Neither is 12345. I think that's the passcode for some idiot's luggage. Internet? I don’t even use a debit card! Is it me or do older folks think they have to have cash on them and that they must know their banker’s name? You expect them to suddenly embrace technology when they don't even trust themselves or the bank they have been using for years? We all get the spam emails. Still, for some reason older folks don’t get the idea of viruses and scams. They get an email telling them they just won $500,000 and the first thing they do is click on it. They never learn. Try and tell an older person how convenient it is to shop and suddenly they get all defensive about their going to the store. They somehow think that because you got it online it isn’t as good. They still think going to the store is the way to go. Let’s face it, we are blessed to know how Google works. Older folks aren’t. I can’t fathom how typing in a keyword is so hard but they almost always mess it up and end up on a site that only folks over 18 should be on. Then again, maybe they do this on purpose and only feign innocence. Seriously, even young people have a hard time keeping up. Actually, I hate the fact that I use lol at all but I can’t stop. I hate the internet for this reason. Does this mean I’m old now too? If so that probably means you're old now too so we aren't alone. Let’s face it, older folks watch the news and they remember every single story about an online predator or some other story about computers. They file it away in their heads and break it out when you tell your grandparents about how great the internet is. Everyone has trouble figuring out whether that thing you want to click on is an ad or if it is part of the site’s content. Everyone hates this. Everyone does. Older folks hate this more than all of us. Things that pop-up, especially ads, confuse them. They will invariably click in the wrong place and somehow download adult content at record levels. They swear they don’t know how this happened. Let’s face it, we all hate auto-play ads. Some sites have two or three auto-play ads going at once. It is maddening. You can be searching in silence for hours and then suddenly you forgot your computer speakers were turned all the way up and you damn near jump out of your skin. Now imagine you are elderly with a bad ticker. Heart attack in the making right there. Server responsed at: 04/18/2019 10:38 p.m.